The recent article 7 Preaching Tips I Wish I Had Known Before I Started by Hanniel was very forthright and challenging. I believe there is a distinction between preaching and teaching for they are presented to us as separate gifts. However, there are some general guidelines which would apply! This is written particularly for those involved in preaching the Gospel in assemblies. I was brought up in an era where the preaching of the Gospel was of paramount importance in assembly life, for which I am deeply thankful. Unfortunately today, younger people are not hearing it preached as often, hence a barrenness of upcoming Gospel preachers! Here are a few comments that I trust will be a help to all who handle the Word of God in public. Remember the tremendous privilege and responsibility to speak for God to the human race! This should be taken seriously as a stewardship given to your trust! Dress appropriately and consider to whom you are speaking to. Some assemblies require formal dress while others may be more informal. Whatever way you present yourself it should be respectable as you represent the Lord of Glory. It is very important that the congregation reads the scriptures along with you! It is always good to say if you do not have your Bible with you just listen (or read on the screen if that is available) as I read it. Many assemblies have pew Bibles, so give them the page number as there are often unbelievers present. Do not assume your congregation knows where the passage is you are reading from. 1 Peter 4:11 whoever speaks, as one who speaks oracles of God; whoever serves, as one who serves by the strength that God supplies—in order that in everything God may be glorified through Jesus Christ. To him belong glory and dominion forever and ever. Amen. If it is a case where rebuke or correction is offered make sure you do it in a spirit of love and not in a cold hurtful manner! No private rebuke or correction should ever be given from the platform. Speak clearly and expressively but do not shout! As most buildings now have PA systems it is much easier and softer on the voice. Please be careful using slang words or “street” language as the Word should be spoken reverently. Try not to talk to the ceiling or somewhere in the building. It is good to maintain eye contact with the people. Be careful also not to repeat words or phrases too often! Plan your message well and keep to your allotted time. Interpretation and application are so essential in presenting the Word. 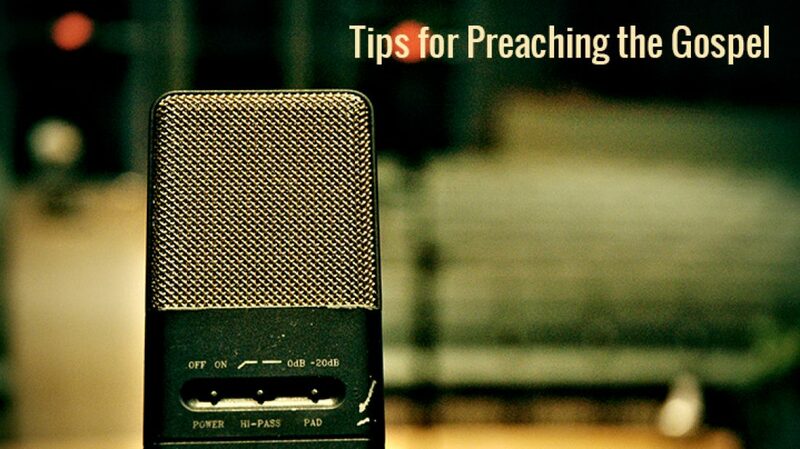 Preaching without application will not hit the hearts of the listeners. Avoid at all times making reference to individuals or churches in a negative way! Try to avoid using many fillers, stories, humour etc. which can distract from the preaching of Scripture. While some can be helpful, too much can be a hindrance! Books and recorded messages can be a help in preparing a message but allow the Holy Spirit to teach you Himself from good study of the Scriptures. Don’t fall into the trap of imitating others. Just be yourself. God has made each one different from the other. It is the personal uniqueness of every preacher that makes him and his message stand out. What a tremendous variety of men God has used and it was their individuality that left great impressions on the listeners. Do not be forced into taking on more than you are able. This is so true especially for younger men who can easily be discouraged and give up! While it is good to accept invitations do not be afraid also to say no. I was 18 years old when I started to do some preaching in other assemblies. In those days all invitations came by mail. I was asked to come and take a series of meetings on the Epistle to the Hebrews. My response then was, I think this must have been sent to the wrong Jim Paul as this is out of my depth. I said no and while I smile at it now it was still the right decision to make. If you are challenged about a point or questioned and you do not know the answer, don’t bluff your way through it. Say you will look into it and get back to them later. There is no shame in not knowing an answer. Accept good constructive criticism from experienced men and women. I am indebted to some good godly sisters who nurtured me along with their wise counsel and prayers. Many more things could be considered just a few to ponder over. If you would like to send some that has helped you in the past let us know about it in the comments below! Here are a few quotes from well known preachers! I have not mentioned their names for it is more important to consider what they said than who said it. Wonderful! Wonderful! I just saw some of my mistakes and I am just excited to hit the streets again. God bless you, Brother Paul. When I began to preach I was given advice by an older brother to be hid behind the CROSS. Let Jesus Christ and His message be the attraction and not me. About length of message. Have a good beginning and a good ending and keep them close together. Very helpful advice. Thank you brother. My dad gave me some great advice that I always keep in mind.